Born: 25 October 1869, Durban, South Africa. Died: 23 July 1949, Durban, South Africa. J.B. Romer Robinson, attorney and businessman, was the eldest son of Sir John Robinson, the first prime minister of the Colony of Natal, and his wife Agnes Blaine. He was educated at Durban High School and Hilton College, near Pietermaritzburg, and later became a partner in the firm of solicitors Robinson & Catterall. In 1898 he married Violet E. Titren, with whom he had three surviving sons. As a member of the Durban city council Robinson emphasized the need for green areas in the central city and supported the importation of exotic tree species for botanic gardens. Robinson was a keen angler and had a strong interest in marine fishes. During 1906-1907 he presented 100 sea fishes from Natal to the South African Museum, Cape Town, many of them either new species or new to the museum's collection. Additional specimens followed during 1908 and 1909. J.D.F. Gilchrist* and W.W. Thompson* published descriptions of the species in their "Descriptions of fishes from the coast of Natal" (Annals of the South African Museum, 1908-1911). Robinson also presented specimens to the Durban Museum. These were described by C. Tate Regan* in the Annals of the Durban Museum (1914-1917, Vol. 1). Additional specimens collected at Durban by Robinson and H.W. Bell-Marley* were described by Regan in Volume 2 of the Annals (1917-1920). A few years later Robinson and James S. Dunn published a book on Salt water angling in South Africa (Durban, 1923). 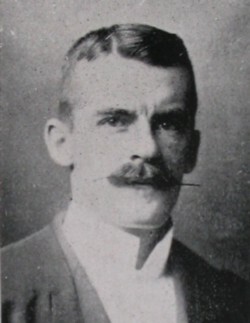 In September 1910 Robinson was elected joint vice-president of the newly established (but short-lived) Natal Scientific Society. Following the death in May 1911 of the society's president, A.D. Millar*, he became acting president. He contributed at least one paper to the society's proceedings, "A few notes on the sensory organs of fishes", which was published in the society's journal The Naturalist (1911, Vol. 1 (3), pp. 209-220). At this time he was president also of the Natal Coast Anglers' Association. Robinson retired from his law practice in 1932 and became manager of The Natal Mercury. In 1947, two years before his death, he furthermore established and managed The Natal Sunday Post. After his death one of his sons, Rodney Romer Robinson, took over the management of The Natal Mercury. Annals of the Durban Museum, 1914-1920, Vol. 1-2. The Naturalist (Durban), 1911, Vol. 1, Numbers 3, 5 and 6: Council of the Natal Scientific Society, and paper by Robinson.